This was an extension of an earlier FDC board. If you have a color picture of this board you would like to share please let me know. The FDC-II features include an on-board data buffer which allowed operation independent of the CPU. Thus. the FDC-II did not require any particular processor speed nor continuous processor overhead when transferring data to or from the floppy disk drive. Data transfer to the system was accomplished by memory-to-memory move instructions because the FDC-II occupied a space in the microprocessor memory field. DMA was not used, avoiding the compatibility problems which often arise from DMA operations. Control up to four 8" and four 5" drives simultaneously under software control. Simultaneously perform seek operations on all drives connected to the system. IBM diskette formatting provides for ease of information exchange with IBM-compatible controllers using similar operating system software. Compatible with most double and single-sided drives (i.e., GSI, Siemens, Shugart. Micropolis, PerSci, Remex, Innotronics. MFE. Qume and any other ANSI-compatible flexible disk drive). Automatically read sequential sectors on a diskette. With appropriate software, the uPD765 could automatically read both tracks of a two-sided diskette. Maximum formatted data storage available was 286k bytes for a double-sided mini-diskette and 1024k bytes on a double-sided maxi-diskette. Under software control, record (sector) sizes of 128 (single density only). 256. 512, or 1024 bytes could be selected. Phase Locked Oscillator (PLO) — An on-board phase-locked oscillator is used to stablize separated information and clock for precise data recovery. An on-board 2708 EPROM provided a bootstrap program for a disk operating system The 2708 could be easily altered by the user for his particular system. The FDC-II could also use the newer 2758 EPROMs. Pre-write compensation wass used when writing to the disk drive for more precise data encoding. Motor control was provided for mini-drives or PerSci drives. Both the bootstrap EPROM and the data buffer activated the S-100 phantom line when accessed. ANSI-standard disk drive interface. A 50-pin and a 34-pm header are provided on the board. Any S-100 compatible CPU could be used with the FDC-II regardless of clock speed, but boot software in the on-board EPROM was compatible only with the 8080 and Z-80 families. The brochure for this drive can be obtained here. The schematic for this drive can be obtained here. The manual for this drive can be obtained here. 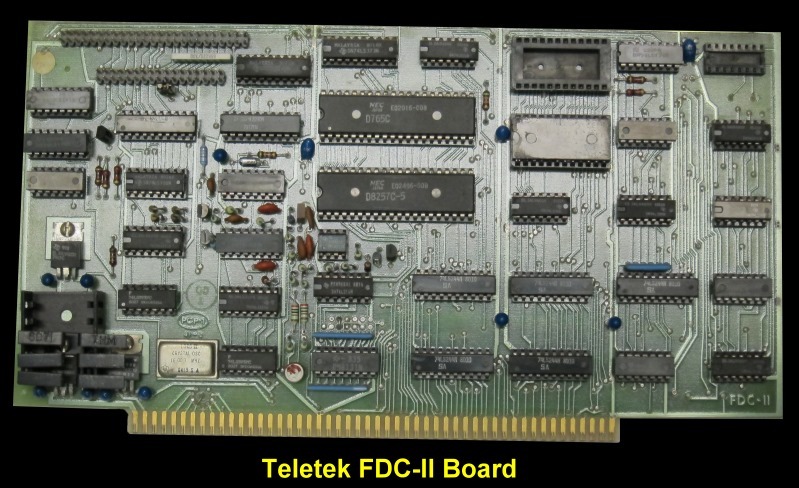 The CPM BIOS/loader/Format program provided by Teletek can be obtained here.